Fulbright alumna Hjayceelyn Mancenido Quintana received the Quezon Medal of Honor for her work as an ambassador. As an ambassador to the U.S., she launched the Philippine-U.S. Congressional Caucus at the U.S. House of Representatives. 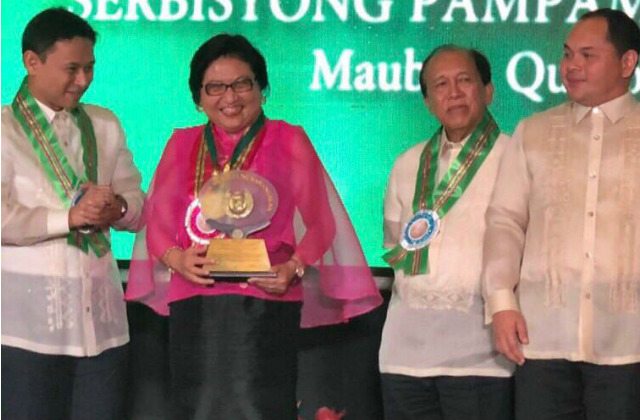 MANILA, Philippines – Hjayceelyn Mancenido Quintana, the Philippines' incoming ambassador to the United Arab Emirates, received the highest award from Quezon province – the Quezon Medalya ng Karangalan (Quezon Medal of Honor). The Department of Foreign Affairs (DFA) announced on Sunday, August 18, that Quintana received this award at the Queen Margarette Hotel in Lucena City on Friday, August 16. Quintana hails from Lucena City and Mauban in Quezon, the DFA said. The province handed her this award for committing herself to public service "and excellently representing the Philippines in her various postings in Washington DC, China, Ireland, and Oman, and until recently as Foreign Affairs Assistant Secretary for Middle East and African Affairs." Quintana said she is "honored to receive this award named after President Manuel L. Quezon." "President Quezon made 'social justice' the cornerstone of his philosophy and his 'open door policy' made the Philippines a safe haven for Jewish refugees fleeing the Holocaust in the 1930s," Quintana said. "These are important and inspiring facets of history that make me proud to be a recipient of this award that bears the President's name," she added. The DFA said the Quezon Medalya ng Karangalan "is the highest award given to a native of Quezon who has exemplified the qualities and characteristics of former President Quezon." Present in the awarding ceremony were Senator Juan Edgardo Angara, House Minority Leader Danilo Suarez, and Quezon Governor David Suarez. Quintana is set to take her post in the UAE after the Commission on Appointments on February 21 confirmed her nomination as ambassador. A first-placer in the competitive Foreign Service Officers' Examination, she was a scholar of two prestigious programs – the US Fulbright program, under which she studied international public policy, and the British Chevening scholarship, under which she took up diplomatic studies.